Offline maps for ArcGIS for Desktop on your tablet. 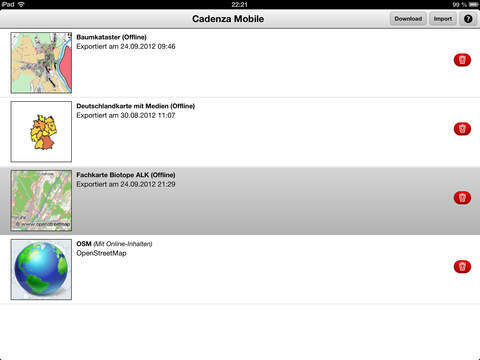 The new version of this app “Cadenza Mobile NG” is available in the app store. GIS 2go is the extended arm of your Esri ArcGIS for Desktop: You can now use your spatial and object data including linked media and office documents on your iPad while on the go – even offline, i.e. without any data connection. 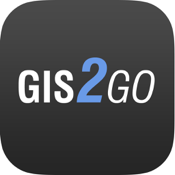 GIS 2go consists of an app and an add-in for Esri ArcGIS for Desktop which allows you to export maps for mobile use and to reimport data collected on the go. The add-in for Esri ArcGIS for Desktop can be downloaded from our website. - display object-related documents and media data. Add graphic notes directly to the map while on the go. 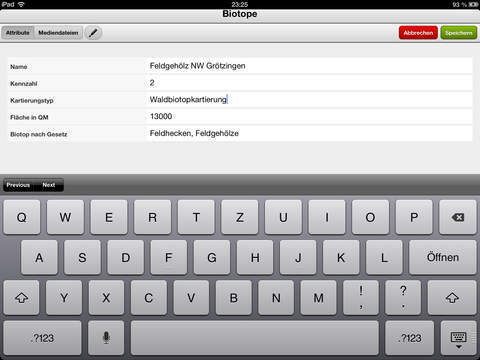 You can create text notes, points, lines and areas. Complement your notes with photos and audio/video recordings. When you are back in the office, you can export the notes and media created on the go and update your desktop map accordingly.